This classic carved wooden door brings out the traditionalist in you! 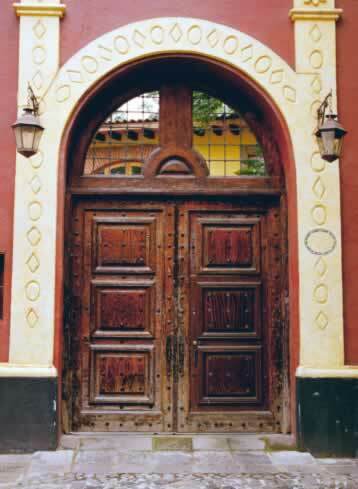 Wide, reinforced panels are dotted with decorative nails, and the distressed paint carries through the effect of a courtyard entry to an French, Spanish, or Italian estate. The entry is set on wide tiles and wide, definitive columns that echo a centuries-old tradition of combining glass and wood into a proud archway. Gold trim-work picks up the theme created by bronze or plated coach-lanterns in this pocket-door setting. Fine-crafted glass panels in the archway invite visitors to the courtyard beyond, while revealing a tantalizing glimpse of the rich colors and beamed roofline of the home. The combined effect of the elements suggests strength, tradition, and Italianate refinement. There's really no substitute for fine craftsmanship when it comes to authentic wooden doors for your home. The wide bottom rail provides long-term durability and lasting value.